Handmade leather cuff watch. 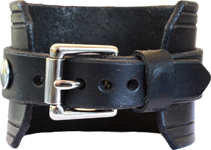 Watch band in the photo above is 2 inches wide and made with genuine leather. Casio timepiece measures 40 mm across and has a black dial. Timepiece is battery operated and water resistant. Leather color and size options can be selected at the bottom of the webpage. Our unique handcrafted cuffs are all made with genuine leather.